The company was created in 1967. It was founded by Jan Zych (born in 1935, Płock), who made his first steps in the profession of master organ-building in 1958. After some years, in 1967, he began working independently in a small, newly built workshop (24 m2 in surface). In the beginning, he chiefly made pneumatic consoles, and later windchests, bellows, and wooden pipes. Jan Zych’s company developed slowly. 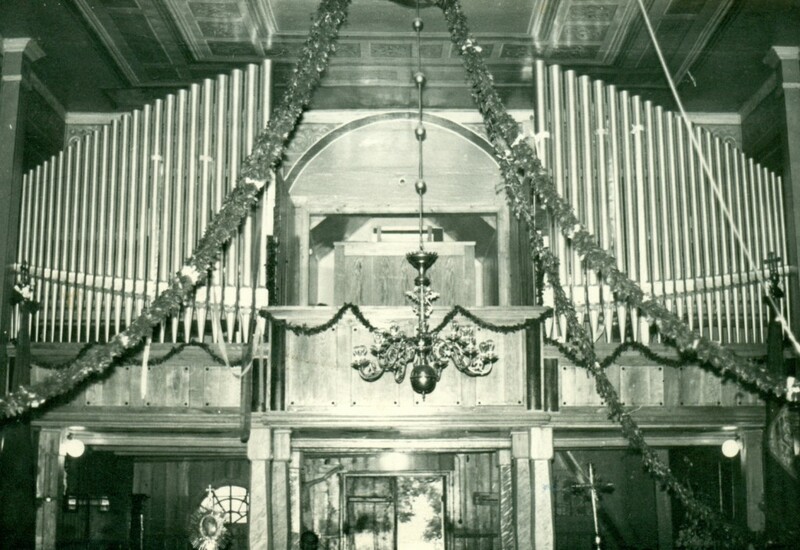 In 1975, it built its first new organ, with 15 stops, for the Siennów parish near Przeworsk in the Przymyśl Diocese (parafia Siennów k/ Przeworska, diecezja przemyska). As new commissions flowed in, the workshop gradually became too small. To remedy the pervasive tightness, another modest space was built in the mid-70s. In 1982, Dariusz Zych, an electrician by profession, began work under his father’s supervision. He introduced electric control in the place of the pneumatic action applied previously. As evidence of further development, the company again began lacking workshop space. Another addition was built in 1984, which coincided with a major commission for a three-manual organ in the Mother of God, Queen of Poland Church (parafia p.w. Matki Boskiej Królowej Polski) in Otwock. A year later, formal reception of the instrument was carried out by Professor Feliks Rączkowski. The official record drawn up at this time became the company’s postcard and initiated a new stage in its history, rich in realizations of ever larger, and ever more significant organs. Among the simultaneously abundant commissions for small organs, the workshop carried out an enlargement, along with a modernization, of the organ in the Łowicz Cathedral (Katedra Łowicka) in 1989. 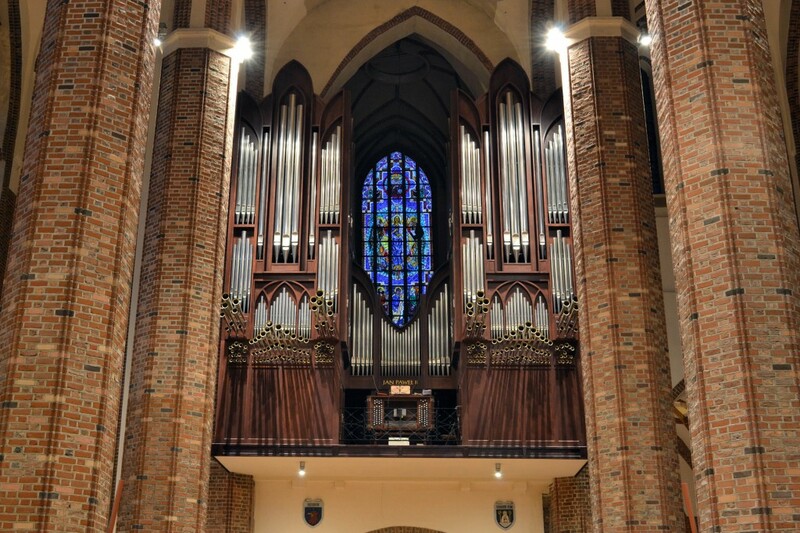 Almost immediately following the work’s completion, the investor of which was the Bishop of Łowicz, Józef Zawitkowski, the cyclic International Johann Sebastian Bach Organ Festival was inaugurated. The fame garnered by Łowicz’s concert organ brought in another large realization, a 44-stop instrument for St. Joseph’s Church in Kielce (kościół p.w. św. Józefa w Kielcach), completed in 1990. The growing volume of commissions and number of employees resulted in the decision to expand the workshop for the third time, to 130 m2. 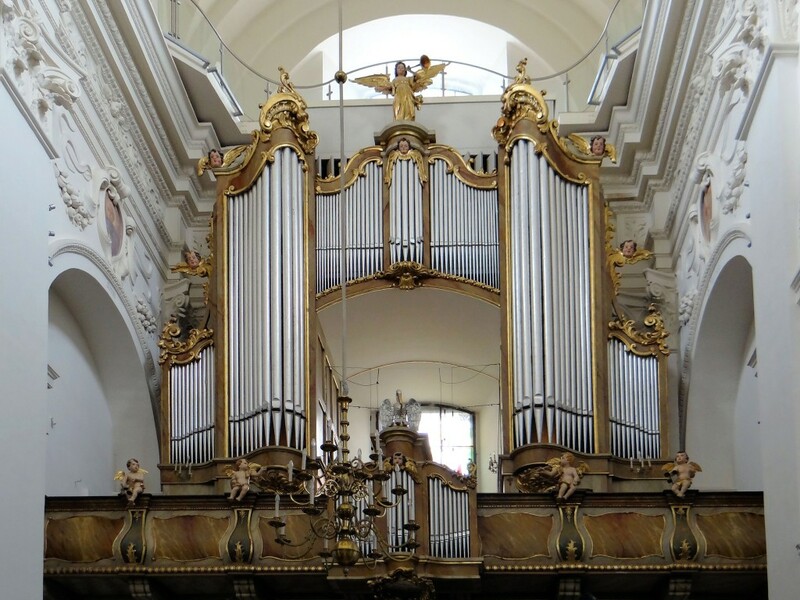 At this time, the company made a number of large instruments, including organs for the St. Magdalene’s Church (kościół św. Magdaleny) in the Bródno district of Warsaw (35 stops) and a church in Skierniewice (37 stops). Political and economic changes in the early 90s made possible contacts with Western companies. Such mutual contacts were fruitful in the implementation of mechanical action in keeping with the best of models. This development was a great watershed in the company’s activity. From 1995, all its organs are built on the basis of this system. An abundance in new commissions and the impossibility of further enlargement in the space forces the decision to invest. In 1996, a contemporary workshop is built with a surface of 1000 m², with an assembly room accommodating organs of up to 40 stops, wood-drying kilns, finishing booths, rooms furnished with contemporary machines and devices. A new workshop, highly trained professionals, wonderful new instruments. The list continues: in Pruszków – St. Casimir’s Church (kościół św. Kazimierza), in Polkowice – St. Michael’s Church (kościół św. Michała), in Warsaw – the parishes of the Nativity (parafia Narodzenia Pańskiego), St. Jude Thaddaeus’ (św. Judy Tadeusza), St. John Cantius’ (św. Jana Kantego), the Warsaw-Praga Cathedral (Katedra Warszawsko Praska), and All Saints’ (Wszystkich Świętych). The latter of the list marks the beginning of a new era in the company’s activity. A symphonic-concert organ with 64 stops (CD recording: Nowe organy kościoła Wszystkich Świętych – New Organ of All Saints’ Church). News of these instruments reaches beyond Poland. The company receives a commission from the Catholic Cathedral in Taegu (Daegu), South Korea, 27 stops. This brings new experiences and success. Owners and employees of the company believe they achieved everything. But little do they know, the ‘commission of their life’ has yet to come, and appears in 2002. Father Eugeniusz Makulski, custodian at the Old Licheń Basilica (Bazylika w Licheniu Starym) turns to them with a request for an organ building offer for the newly built Basilica. With the starting point of a plan positioning the organ’s specific parts and a concept of its sonority (disposition of the stops and mensuration of pipes) developed by Prof. Andrzej Chorosiński, the company prepares an offer to build a 157-stop instrument, which is accepted by the investor. 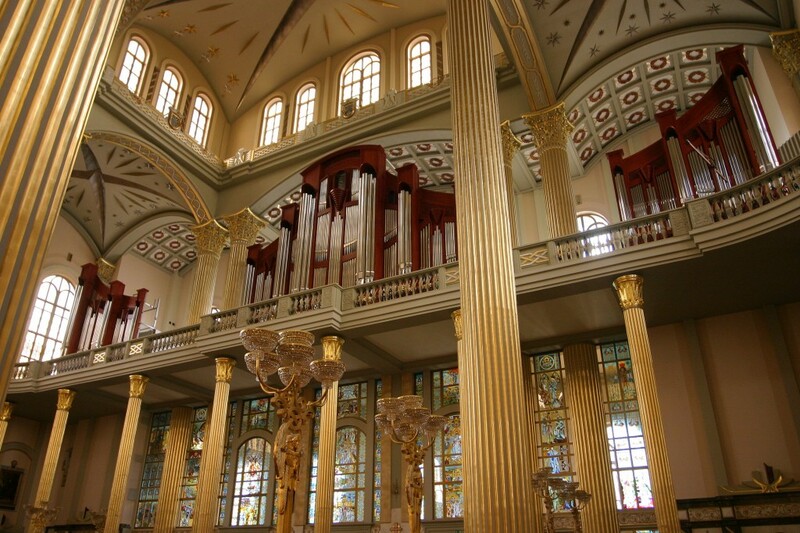 As early as in June 2003, the Great Licheń Organ’s part I, a 51-stop organ on the Western choir loft, is handed over and consecrated. A day after the consecration, Prof. Andrzej Chorosiński records a CD: The Licheń Basilica Organ: On the Organ of the Western Nave (Organy Bazyliki Licheńskiej: Na organach nawy zachodniej). Work on further sections continues until June 2006. On August 1 of that year, an international council of experts accepts the Great Organ of the Licheń Basilica. The organ is the third largest such instrument in Europe and twelfth in the world. Karol Gołębiowski presents the final shape of its sound on a CD recording Great Organ of the Licheń Basilica (Wielkie Organy Bazyliki w Licheniu). After the work’s completion in Licheń and with gained experience, the company realizes further large projects. A 71-stop symphonic organ at the Church of Blessed Ladislai of Gielniów (kościół Bł. Władysława z Gielniowa) in Warsaw (the largest organ in the city), and a 66-stop instrument at St. Jacob’s Cathedral (Katedra Św. Jakuba) in Szczecin. 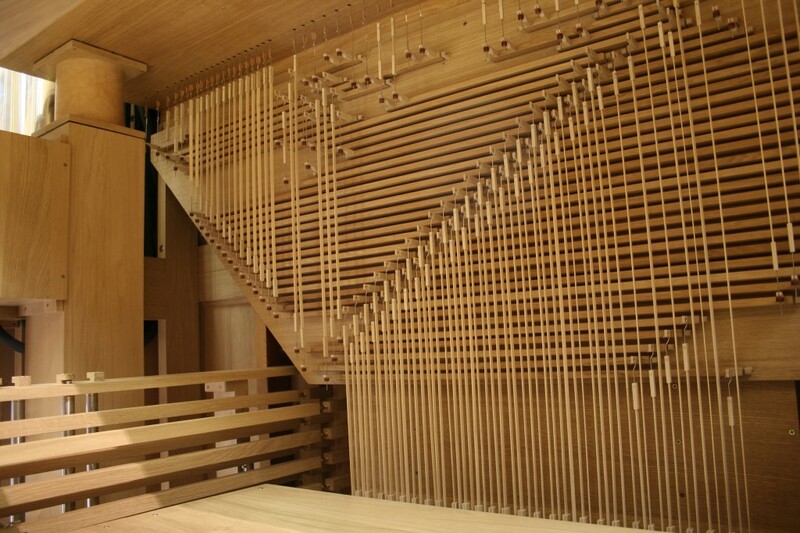 A departure from this style of instrument is the organ built in 2008 in the Markowice Sanctuary near Inowrocław (Sanktuarium w Markowicach k/ Inowrocławia). After a series of instruments tying in to the tradition of French Romanticism, its type of sound and construction is a stylization of Arp Schnitger’s north-German baroque organs. Suspended tracker action, every pipe metal and ‘cut to tone’, unequal Valotti temperament, pipe mensuration and alloy modeled on the surviving pipes of the style’s representative, as well as the intonation result in the instrument’s special possibilities in sound quality characteristic of the Baroque period. Testifying to the fact is a CD recorded by Karol Gołębiowski, Masterworks of Organ Music (Arcydzieła muzyki organowej). An immense number of built instruments allows the company to continually work on its own development. In 2009, a division of metal pipe production is launched, together with a casting workshop for tin sheet metal. In addition, the instruments’ high quality, confirmed by virtuosic performers and musicologists, opens the way to realizations of instruments in secular locations. 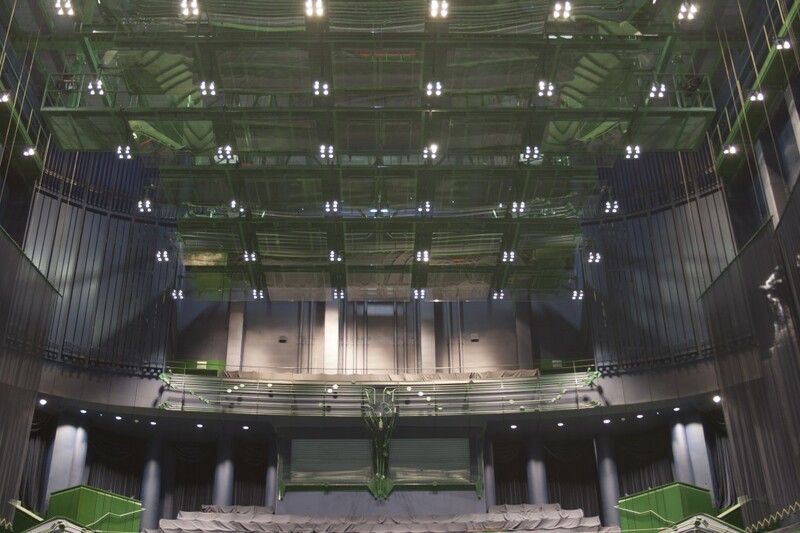 In 2010, the enterprise commences work on the organ for the main hall of the Podlasie Opera and Philharmonic – European Centre for the Arts in Białystok (Opera i Filharmonia Podlaska – Europejskie Centrum Sztuki w Białymstoku). Two organ divisions constituting the instrument’s main part (51 stops), are placed over the upper balcony, while the diatonically divided positives (8 stops) are mounted on both sides of the footlights. This masterpiece’s immense success resulted in the succeeding commissions for didactic-concert instruments made from public institutions. These institutions were the Karol Lipiński Academy of Music (Akademia Muzyczna im. Karola Lipińskiego) in Wrocław (17 stops), and the University of Humanities and Natural Sciences (Uniwersytet Humanistyczno-Przyrodniczy) in Siedlce (12 stops). Presently, the Zych Organ Workshop is a team of over a dozen perfectly trained specialists. They range from carpenters and mechanicians, to master organ-builders and pipe builders, as well as musicians. In the current year, the company conducts work on six mechanical organs. The company is a longtime and permanent member of the International Society of Organbuilders (ISO).